When hauled (or pushed) by a locomotive, this cleaning car can either vacuum your trackbed, or provide a rotary cleaning or abrasive action. Compatible with DC, can supply LocoLube track cleaning fluid, Isopropynol, or Goo-Gone. Can be converted to DCC either by fitting a DCC decoder. Not DCC Ready, would require wired in decoder for DCC operation. Easy track cleaning tool with replaceable pads. Replacement pads for track cleaning tool . Clean your track blindfolded! The Rail Tracker cleaning tool actually follows the track and hugs the rail while you clean, making track maintenance a breeze. Convenient kit includes everything you need to clean and maintain your track. The Rail Tracker cleaning tool is ergonomic in design, featuring a pad holder that locks in place or swivels. Used with the included handle, this self-guiding system makes it easy to clean hard to reach areas, like inside tunnels, around structures and under power lines, etc. 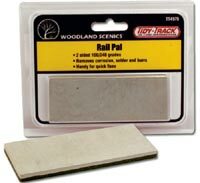 Replacement pads available.Works for N, HO and three-rail O scale track. Replacement Pads for Rail Tracker™ Use Rescue Pads for semi-annual cleaning to remove heavy build-up. 2 replacement pads per package. Stop cleaning locomotive and rolling stock wheels individually. Roto Wheel Cleaner cleans all wheels at once quickly and will not scratch wheels. Power from transformer or track. Includes 2 sets of cleaning pads and 1 set of scrubbing pads. N scale Roto Wheel Cleaner will accommodate locomotives up to 6 3/8″ and rolling stock up to 5″. This tool is for cleaning loco whells. Just set it on a powered track and set each end of the loco on the cleaner , it does the rest. For DC or DCC. FEATURES * Precision Machined Parts. * Solid Brass Construction. * Non-unraveling pads. * Body mount MT and Rapido couplers. * Easy Fill Design. * Leak proof valve and fill port. * Heavy weight does the job. * Quick Change Pads. * Drag pads wont catch on switch points, frogs, and any other pieces of trackwork. * Spill resistant design. * Solvent proof design. * Both solvent/abrasive options. * Large reservoir. * Multi-directional (push or pull) * Controllable dispensing rate. Track and Wheel Cleaning *Clean track, and wheels are absolutely necessary for reliable Command Control operations. Rail cleaner comes assembled with trucks and couplers mounted, and includes a brass roller, ten roller covers, and one elastic band (may be used instead of string), as shown in the image on the left. Have you lost a roller or want to keep extras made up for different solvents and fluids? This roller only fits N1 and N2 models. Have you lost a roller or want to keep extras made up for different solvents and fluids? This roller only fits D10-D12 models. Stock up on your Roller covers and save time. 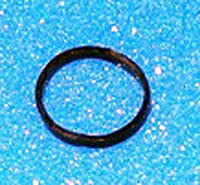 Pack of 10 These roller covers only fits N1 and N2 models. These roller covers only fits N1 and N2 models. These are the cats meow for holding your Roller covers on and save time. These bands fit all N scale models. Pacer Technology’s Rail-Zip is a track and wheel cleaner that is designed for improving electrical contact. It is used for slot car racing and model railroads to eliminate accumulations of oxide, which insulate and interfere with smooth electrical conductivity. Without being corrosive, Rail-Zip removes oxide and prevents oxide formation. If your wheels are clean (free of gum) but corroded (oxidized, rusted) your locomotives will still not run smoothly. With Rail-Zip on a Gumbuster, problem engines can be restored to like-new performance. Rail-Zip does not cause any residual electrical problems but does lubricate metal. In other words, you want only a thin film of it on the wheels or track. The perfect semi-hard track cleaning block to remove tarnish and improve conductivity.